This post is part of a series about interesting developments in the community related to EasyRPG & RPG Maker 2000/2003. If you have anything interesting to show, please prepare a draft and send it to us, then we will consider publishing it. Most work on EasyRPG is focused on EasyRPG Player. It’s the engine to run the games, equivalent to RPG_RT.exe. But the games need to be created before they can be played. In the future, EasyRPG will include its own game editor. But this is a lot of work, and it’s not a priority right now. So, when creating games you have to rely on external editors. Most popular ones are RPG Maker 2000 and 2003, because EasyRPG is compatible with them. But there is a new option to try out: R48. Full-colour image support. No more need to convert your images to 256-colour format. It’s multi-platform thanks to Java. You can run it on Windows, Linux and macOS. There’s also an Android build but it is not optimized for touch input. Support for many languages, thanks to Unicode. You want to create a game in Greek, Georgian or Kazakh? We’ve got you covered. Unicode is optional: you can edit games in legacy encodings, too. It’s free software placed into public domain. 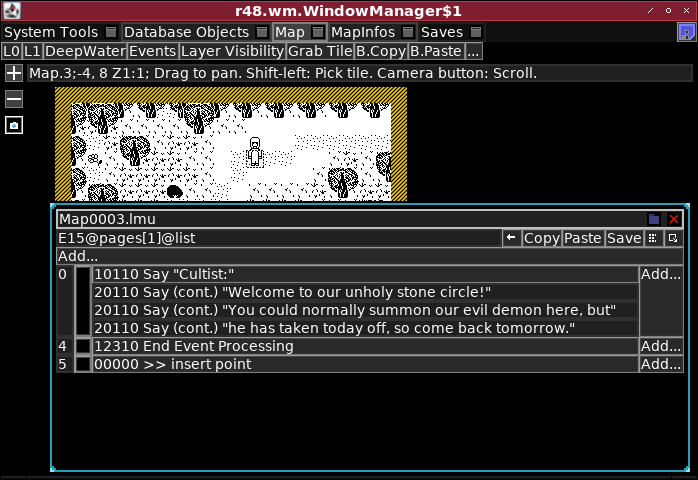 EasyRPG Editor aims to be a drop-in replacement for RPG Maker 2000/2003: intuitive and easy-to-use. R48 aims to be powerful, allowing to edit many complex internal details and different formats (it even has a mode for editing RPG Maker XP and VX Ace games!). Also, R48 is just different. It implements the same feature set, but does it in a different way from RPG Maker. But this shouldn’t discourage you from trying out R48! It’s free so you’ve got little to lose anyway. Below are a few simple steps that can get you started with this editor. The JAR file is for desktop computers. To run the JAR file, you would need a Java runtime environment (aka Java virtual machine). You would need to install the JVM for your operating system and open the JAR file with it. If you use Windows, you can download the JRE for Java 8 from Oracle. After installing it, you will be able to run the .jar file by double-clicking it in the Explorer. Alternatively, you can set up your system to open JAR files by double-clicking, see the instructions here. The APK file is for Android. Allow installing applications from third-party sources in the settings. Note that the Android version is pretty preliminary, and it might be hard to use: the buttons are too small and clicking on them might be difficult. R48 doesn’t come with the engine: you need to use EasyRPG Player for that. It doesn’t even have a “Run”-button. Instead, you’ll need to run EasyRPG Player like you normally do in your operating system. In Windows, you can download EasyRPG Player and place the Player.exe in your game folder. First, you need a game directory. That is, a folder where your game will reside. If you want to create a new project, then just make an empty directory that will hold your game. Once opened in an empty directory, R48 will offer to create a “skeleton project”: a bare-bones game that you will build upon. R48 creates quite a lot files and subdirectories, so make sure your initial directory is empty. If you want to edit an existing game, your game directory is a directory where RPG_RT.ldb and maps (Map0001.lmu, Map0002.lmu, etc.) are located. Note that existing games made in RPG Maker 2000 and 2003 might depend on the default set of graphics and sounds called RTP. R48 doesn’t come with its own RTP, and doesn’t have a direct RTP support at all. If you want to edit a game with R48, all its resources should be inside the game folder. Note that it might be illegal to edit games made with RTP in R48, because RTP license only allows to use it with RPG Makers and R48 is not an RPG Maker. Consult the RTP license and your local laws before doing that. R48 has two ways of choosing the game folder. First, you can just drop the .jar file into the folder where you’ll edit the game, then run R48 without specifying path to game and it will use the folder where the .jar file is located. Second, you can use the “Path to Game” field after opening R48. Note that you need to click on the field under “Path to Game (if you aren’t running R48 in the game folder)” label, enter your path, and press Enter. The last bit is important: Whenever you type text in R48, you need to confirm your input by pressing Enter. Otherwise, your text will be ignored. After choosing the game folder (or leaving it blank, if you have placed R48 in the game directory), choose the target engine. For games that are compatible with EasyRPG Player, choose the “RPG Maker 2000, 2003, or EasyRPG” option. If you plan to edit your game with RPG Maker 2000 or 2003 in the future, choose the legacy encoding relevant for your language (the official engine from Steam only supports “English/French/CP1252”; the official Japanese version used “Japanese/MS932” and fan translations used different other options). If you’re editing an existing RPG Maker game, you should use the legacy encoding relevant to the language of the game. If you don’t need RPG Maker compatibility, try the UTF-8 encoding. This is a modern encoding supporting all kinds of languages. If your language was not supported by RPG Maker, it’s your only choice (e.g. Armenian, Georgian, Greek). Remember the language choice you’ve made in this step. You will need to choose the same encoding each time you edit the game later. If you’re starting R48 in an empty folder, it will offer you to create a bare-bones project compatible with RPG Maker 2000 or 2003. Agree to this and you’ll have a number of subfolders created in your empty folder. After creating an empty project, press the Save button in the top right corner of the screen to save all the modified files. If you’re creating a game in English or in most Western European languages you can skip this part: your language will be recognized automatically. You can edit the main text strings in the game. You can edit the RPG_RT.ini file in the game folder. Click on the ‘Database Objects’ tab in the top. Click on RPG_RT.ldb button — this is the file containing most game data. Find @terms and click on the button to the right of it (it would have a number in brackets, like  — click on that number). Scroll the list down to optStart, optLoad and optExitApp, and edit the text of these buttons: they are shown on the main screen. Click on the current text (e.g. “Begin”) to start editing the button. Edit it, and press Enter to confirm your changes (this is important: if you don’t press Enter, your text will be removed!). Replace “Load” and “Exit” text with text in your language similarly. Press the “Save” button (either in the RPG_RT.ldb window, or at the top right corner of the main window) to save your changes. Voilà! Now EasyRPG Player will be able to determine the language of your game by checking these buttons. Yay! Now you can run EasyRPG Player in your game folder to ensure that the main menu correctly displays the text. 65001 means “UTF-8”. For the legacy Japanese encoding, use Encoding=932. For the legacy English, French and Swedish encoding, use Encoding=1252. For the legacy Cyrillic encoding, use Encoding=1251 line. After you’ve done this, you can start editing the actual game content in your language. Database Objects contain game-wide settings. RPG_RT.lmt specifies the player’s starting point (where the game starts), and RPG_RT.ldb specifies most game-related things (available actors, skills, items, enemies and enemy troops, tilesets to create maps from, and more). MapInfos allows to select an active map and add new maps. Map allows to edit the active map. You can edit the map by laying your tiles on two levels (L0 and L1), by placing Events (that represent everything non-static, e.g. passages between maps or non-playable characters). There is also a Resize option (hidden behind the … button) that allows to change the map size. Most changes are not saved by default. Use the Save button at the top right corner of the window (represented either by a floppy disk icon, or by a text “Save All Modified Files”) to save all your changes. When you edit a text, your changes will not be applied until you press Enter. Moving to another field without pressing Enter will revert your changed text! Basically, this interface allows you to change anything in the game. There’s much more to R48 (it even has a simple image editor), but the things above should be enough to get you started. If you need more graphics or sounds, you can get them from EasyRPG’s RTP Replacement: https://github.com/EasyRPG/RTP (direct download). The folders in the RTP Replacement are the same as in your game’s folder (e.g. ChipSet holds map tiles, CharSet holds event/NPC graphics, etc. ), so you can just copy the files over to your game’s folder, and they will become available for you to use in R48. If you need help with game creation, feel free to ask in EasyRPG’s community forum the #easyrpg IRC channel at irc.freenode.net. A more user friendly way to reach the IRC channel is via Matrix/Riot or Discord. Please search the Discord invite link because we don’t want to actively advertise non-free protocols. R48 is not yet known enough to have its own forum or chat, but you can get help in the EasyRPG-related places. Author info: This blog post was written by Demetrius. It is this time again! After 30 months since 0.5.0 we present you: The next major release: 0.6.0 “Preemptive Attack”. As the codename tells you already: This release focuses on battles and battles were always really lacking in EasyRPG Player – until now. First we have to tell you: We are sorry! This blog post will not do 0.6 justice. In these 4 months more code was added more than in the previous 12 months. There were so many minor detail changes especially in battle and the savegame system, you can’t write this all down without getting burned out, because typing this is pretty boring and reading it is even worse. That means sometimes this blog post will simply sum up 10 minor changes in one sentence. If you are curious about more details, simply write us a message or read the linked GitHub issues. Especially the battle system was in an interesting situation: In August we received ca. 100 commits by a new developer and they fixed many issues in the battle system and the algorithms but unfortunately this developer had no time anymore and left us alone with these commits. How shall we handle this? Luckily a new developer appeared shortly after and helped us fighting through the mess. We had many long discussions spread over 3 months, some commits were simple, some controversial (will this break games?) and some just wrong. Getting all these patches in was a nightmare and we could not wake up by pressing “9” but in the end we got them all in and now and you can enjoy them in this release! This new release of EasyRPG Player contains lots of savegame compatibility improvements with RPG_RT, but this also means the Player is now incompatible with saves of old versions! You can still load them, but you will see visual glitches: To fix them, simply change the map. If this doesn’t help: You must restart the game, sorry. This should be the first and last time such a compatibility nightmare occurs, because from now on we save the EasyRPG Player version in all savegames. This allows us to ensure savegame compatibility, because we can determine exactly which version created the savefile (#1656) and fix incompatibilities while loading. When in a battle it is possible that battle animations created with the “Show Battle Animation” event command are not properly working, because the interpreter is not waiting for completion. We believe that this is more correct than the previous behaviour, but it breaks the animations in the game Alter A.I.L.A. Genesis. Pictures are now updated before the events. By comparing with RPG_RT we are sure this behaviour is correct but it completely breaks picture zoom in the Smash Bros. clone もしもスマブラだったら. This will be fixed in 0.6.1 when a new, more accurate interpreter is implemented. The ChangeEquipment event command crashed when a two-handed actor got the weapon in the first slot removed while the second slot was empty. This broke many effects in Yume2kki. Sprites are now properly rendered at borders of small looping maps (20×15, which is the minimal map size) . When a sprite overlaps the border of a looping map it is rendered two times or four times, depending on the corner. Before Player only rendered the sprite once. Contrary to RPG_RT we support proper looped rendering for the airship and fixed a visual glitch: When the Pan is locked events on the most bottom row become invisible. (#1216, #1541). This video is a glitch exhibition of RPG_RT panning bugs. We don’t emulate them, EasyRPG Player will behave correctly in all these cases. All screen effects were applied one frame too late, you probably never noticed this but as we become more compatible we care more about timing. With these bugs fixed the game Desolate City: The Bloody Dawn (Enhanced Edition) becomes fully enjoyable. When a character dies, all the other states are erased, the defense, charge, gauge and stat modifiers are reset, and the current attribute shifts erased. When the default cancel option in a `Show Choice` is an unused choice, e.g. when you have a Yes/No Answer and Cancel is the 3rd, non-existing, the Player does not crash anymore (#1634). This release features a gigantic amount of battle changes especially to the algorithms and the RPG Maker 2000 battle UI. 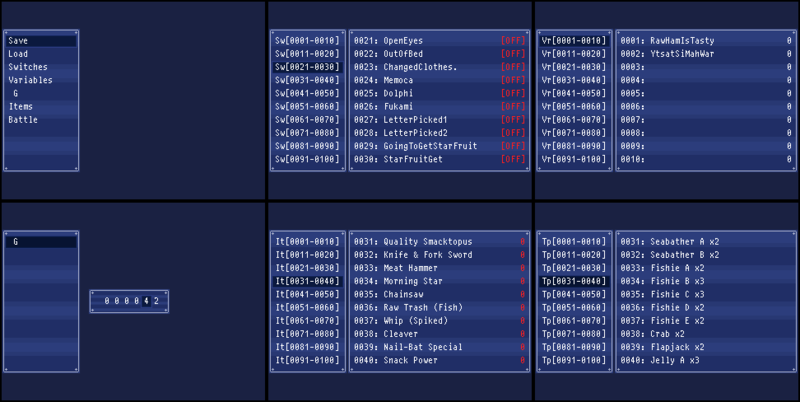 The RPG Maker 2003 battle UI did not receive many improvements. We want to handle 2003 in a later release but all the algorithm changes also apply to RPG Maker 2003 battles. The victory message has correct amount of delays. In some cases the amount of SP recovered reported -1 instead of the real value. When an ally receives damage the screen shakes now. Dead enemies cannot attack anymore. When you hold Cancel while a battle executes the battle will stop. The battle message box was completely rewritten. 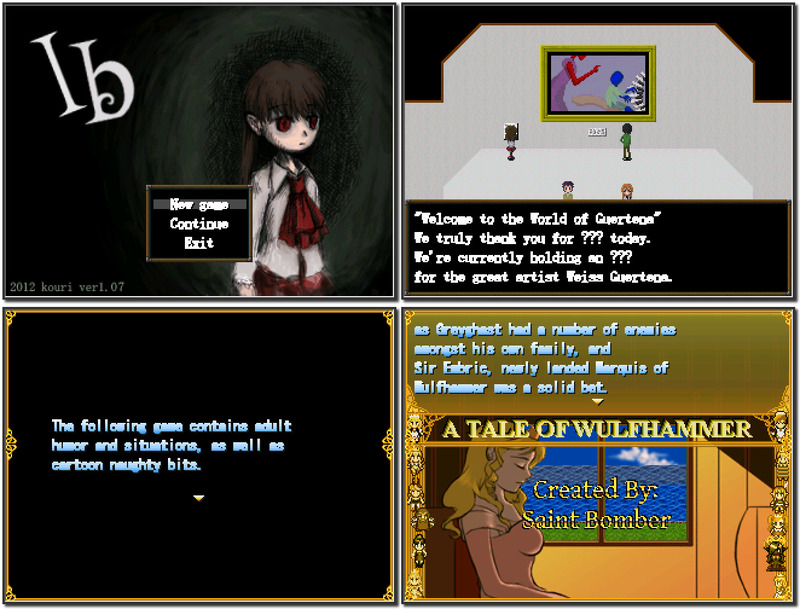 All the messages generated should now match the RPG Maker 2000 behaviour. including most of the delays. We won’t list them here as the old message box was completely incorrect. When a state was healed right before an attack the state can be caused again. While holding the Decision key the battle execution speed will be doubled. Status effect immunity of items is now supported. Battle Animations don’t block the battle interpreter anymore. Battle music starts playing now when the transition from the map starts, before it started after. 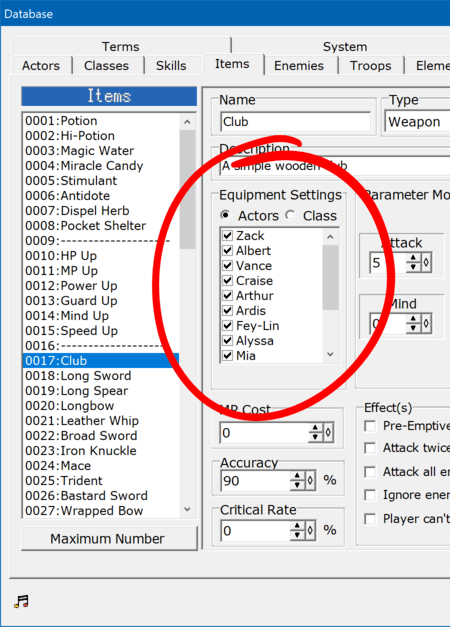 The custom skill name of the actor is only displayed when the “rename skill” checkbox is selected. Weapons that inflict states inflicted the wrong states. The Skill menu remembers now the cursor position. Buffs and Debuffs stack now correctly. Items and Skills that affect groups only reduce the SP once. State probability respects now the armor resistance. The battle is over when the whole party has a “No Move” restriction and the chance of recovery is 0%. When having an ability that halves SP cost the halved SP are rounded up. Equipment that protects against an element works now like a buff and shifts the attribute. Attacks that target all enemies do not hit hidden enemies anymore. The battle windows are now animated and slide from left to right. After loading a savegame in Peuteris Grey the scrolling began to induce motion sickness (#1026). The improved debug scene is full of new features for your testing (and cheating) pleasure. The radio button in the red circle is a global setting! This changes the usability for all skills to either actor or class. BSzili ported the Player to AROS (#1492). Check out his website for obtaining the Player. Our library for reading and writing RPG Maker files got major updates! When you load any RPG Maker file (there are LDB – Database, LMU – Map, LMT – Map Tree or LSD – Savegame) with liblcf and save them without modifications the result will be now perfect down to the byte for 99.9% of all files. The exceptions are files with custom modifications due to patches. We cannot handle them, but we support custom headers and they are preserved. The reading and writing was tested against 1500 games and we hope that this gave us enough coverage to say: Our read and write code is now perfect! This release took us far longer than we expected last year and as you can see the changelog is a bit short for 1 year and a few days of development time. We are always critical low on developers and this year we all had a serious lack of time and other personal issues. Though don’t worry we can still provide you with some cool additions that will improve playing a lot of games. There are tons of battle fixes in the queue but due to there sheer complexity we decided to delay them for the upcoming 0.6 release, hopefully also in 2018. Sorry! A few hours ago we were notified that the author of Deep 8, Independent Art, created a video for us which lists all the advantages of EasyRPG Player over RPG_RT. Thanks for this nice video, it is really a great summary! Due to a change in our shutdown code the Player crashed when closing the Player while in a battle (#1298). Technically this was not our fault, but because of a bug in the libpng library we used on Android the loading of some graphics failed in Violated Heroine ( ͡° ͜ʖ ͡°) (#1311). The support for RPG Maker 2000 1.61 placeholders erroneously prefixed the “Critical Hit” message with the name of the actor in older RPG Maker 2000 versions (#1291). Furthermore Transitions are now implemented as “Drawables” (Graphics rendered by our engine) which means frameskip and fast-forward works now as expected while a transition is active (#1094). The timing of transitions is now also adjusted, e.g. the Game Over scene has slow ones but menu to map is fast. As in RPG Maker when a battle starts the screen flashes now twice and then a zoom effect onto the actor happens (#1369). We would like to thank our new developer Sormat for this significant contribution. The Tone effect performance was significantly improved and is now 50% faster for single effects (Tone or saturation) and 100% faster when both are enabled at the same time (#1380). This change is mostly noticeable on our CPU constrained ports (3DS). All sound effects are now stopped when the sound “(OFF)” is played. As a bonus this also applies to inofficial translations where this string was translated to e.g. “(Brak)” or “(Kein Sound)” (#1120). Monsters with the “flying” attribute move now up and down in the RPG Maker 2003 battle system (#1220). 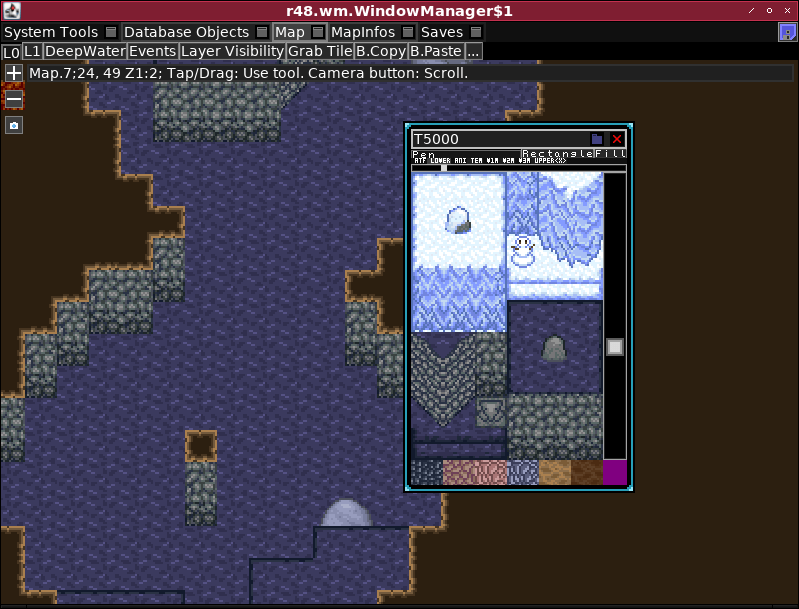 A bug in the alpha channel handling in the Tone Blit code resulted in strange looking weather effects and colored boxes when a battler had an effect in the RPG Maker 2003 battle system (#1225). Due to a bogus check fleeing from random encounters was not possible in RPG Maker 2000 battles (#1350). The placement for party members was incorrect in RPG Maker 2003 battles (#1399). The RPG Maker 2000 battle system reported hidden enemies in the initial enemy appearance message (#1370). Turning a switch OFF after an enemy action contained a bug and turned the switch ON instead. The switch toggling was also broken for some types of enemy actions (#1419). The turn counter for RPG Maker 2000 battles did not increment before determining the enemy actions. This means all enemy actions that depended on the turn counter were executed one turn too late. Together with the previous bug this fixes the battles in Heaven and Hell Episode 3 (#1419). Our Player crashed when using Switch Skills in 2k battle, when there was no target. Now we show “?? ?”, like RPG_RT does (#1440). This only affected games made with the English RM2k release. The game COLORS: Lost Memories uses a modified database with actors of level 0 (normally the minimum level is 1). This corner case is now supported though the game is still unplayable due to interpreter timing issues (#1248). In Razas standing characters were shown with the incorrect movement frame “left” instead of “center” (#1198). When a move route was active while boarding the Airship, the shadow of the Airship already moved with the route while the ship itself was still playing the ascend animation (#1268). Battle commands were incorrectly loaded from RPG_RT save files and the handling of classes was updated (once again) because we figured out that one field in the save game is not “class_changed” but “battle_commands_changed” (#1287). The “Change Class” and “Change Battle Command” event commands support now range based operations on multiple actors. This is an undocumented feature not exposed by the RPG Maker editor interface (#1288). The charset animation frame was not reset to “Middle” when a Jump happens or “Stop Animation” is used (#1289). Pictures with “Scrolls with Map” setting were rendered at the wrong position after a savegame was loaded (#1296) and the last picture of a savegame was not restored at all (#1299). The viewport got misaligned by 2 pixels when the map reached the map border (#1300). This is a strange bug which we already fixed twice before but it reappears under different circumstances. After the strange “Set Vehicle Location” behavior encountered last time which allows moving the party when outside of vehicles (#1257) we got another report. The game 呪いのこうもりさん uses this command for changing maps. This usually crashed RPG_RT but when the event ID is valid on the new map it will magically work. Our Player emulates this now with a teleport, this doesn’t fully match RPG_RT behaviour but is close enough (#1303). A black screen occurred after using the Portable Portal given by the Witch in Violated Heroine. This was a timing issue caused by the use of “SetMoveRoute” with an empty route. An empty route was processed like a normal move route, therefore the interpreter was off-by-one frame and this race condition broke the code. Empty move routes clear now existing move routes and result in a delay of 0 frames (#1308). Spritesheets (a new RPG Maker 1.12 feature) were broken and only worked once (#1331). For implementing screen shake, tiles that were outside of the map were rendered black to avoid graphical glitches, but Frozen Triggers uses a modified 1×1 tile map, therefore the whole screen was drawn black. The implementation was changed and combined with the previous fix the game is now fully playable! Frozen Triggers went from completely unplayable to fully playable. The scripting in this game is insane, a must play! Here a longer gameplay video, they are desynched, which can have various reasons, but you see the difference ;). In Touhou Mother party members became solid after battles or scene transitions. The issue was that the max_stop_count (used to measure how long to wait between move commands) was overwritten on event page changes even when a custom route was executed by an event command (#1344). In Witch’s Heart the Hero was moved to the top-left corner when landing while on the broom. The broom is implemented as the airship vehicle and the Player reported “Not in Vehicle” already while the airship was still descending which caused timing issues (#1349). Play Memorized BGM did not work after a BGM fade-out (remained silent, #1354). This is the 2nd bug fixed in Witch’s Heart. When a new map loads all events have one frame of execution time before the fade-in happens. This behaviour was already implemented but event sprites were not being updated, resulting in visual issues like e.g. instant visual changes after the transition is finished (#1358). This is the 3rd bug fixed in Witch’s Heart. Message substitutions of e.g. \n with a hero of name \n resulted in an endless recursion/hang (#1379). Terrain damage is supported now. Furthermore when the party steps on dangerous terrain a red flash appears now when the receive damage (#1389, #1393). Items that prevent terrain damage are also supported. Therefore you get the full game experience now when you walk in the desert of Vampires Dawn without sun protection. When a vehicle is entered and no further movement happens, the vehicle still faces to the left but the hero actually faces forward. The facing of the vehicle is now updated to match the hero facing direction. This change does not match the RPG_RT behaviour but slightly improves the user experience and has no possible regressions (#1403). When the boat or ship is on walkable terrain (usually not the case for water) the airship can land on the boat or ship. This seems like an RPG_RT bug and we don’t know a single game that depends on this feature (#1404). Calling the menu is disabled now while the player has an active move route (#1404). Events with “Same as character” layer priority can’t move through boats and ships anymore (#1404). Two handed weapons are now fully supported in the equipment scene and by the “Change equipment” event command (#1397). When a monster rapes the heroine in Shitigadianzu the progress bar is now filling up. This was due touch events not triggering while a move route was active. For this change we will not provide a video, because we would need to censor three quarter of the screen and disable the sound (#1412). The movement was glitchy in the currently unreleased game Super Crystal Hunter because “Fixed direction” movements were not handled correctly (#1413). Using the computer multiple times in log. [in] does not result in a black screen anymore (#1416). Our interpreter executed the wrong event commands after “Show/Hide screen”. All our ports support now all music formats and libraries, however, 3DS may have performance issues with some formats (#1332, #1339). You can play now the most memory hungry game on PS Vita: Hero’s Realm (#1340). The Player runs now as homebrew on the Nintendo Switch (#1337). See the previous blog post for more information. BSzili ported the Player to MorphOS and AmigaOS4 (#1415). Check out his website for obtaining the Player. The Player checks the dimensions of assets and issues a debug log in the console/log file when they don’t match the expected dimensions. To reduce the amount of useless debug output this check was disabled for Monsters, Panoramas and Pictures (#1333). The name input scene supports now Traditional Chinese (#1307). Loading of custom ExFont files is supported now. ExFont is an embedded resource in RPG_RT and is substituted when using the strings $a-$z and $A-$Z in messages. When an ExFont.bmp/png/xyz is in the game directory, EasyRPG Player will load now this file. Vgperson already bundles a ExFont in their game translations (e.g. The Grey Garden, Witch’s Heart and Wadanohara), we hope other game creators/translators will join soon ? (#1352). By far the worst: The font of Mr. Saturn is completely unreadable. This game bundles currently no ExFont, you have to provide it by your own! The Skill Menu of a character can’t be accessed anymore when they have a “Do Nothing” restriction (#1395). When a skill is used in the menu the first sound effect of the corresponding battle animation is now played (#1397). The actor target scene used to select a skill target did not render the skill costs correctly (#1397). The hero class is now checked when determining if an item is usable (#1397). When accessing LCF data structures, sanity checks were added to ensure that no invalid objects are referenced which result in crashes. Most of these checks won’t be ever encountered, because otherwise games in RPG_RT would simply fail in most cases. We do not recommend running games from untrusted sources in EasyRPG Player but this change should reduce the exploitable attack surface a lot (#1259, #1345). Due to multiple bugs in the SDL2 library concerning fullscreen mode, the Player starts now always in windowed mode and immediately toggles fullscreen mode. This fixes missing title bar icons under Windows and incorrect/pixelated graphics when switching back to windowed mode under macOS. Additionally, the zoom hotkey determines now the desktop resolution which allows higher zooming levels (#1364, #1406). Two new System database chunks have been identified. One can be neglected, but the other can be used for the equipment usage in 2k3 mode (#252). The CMake build scripts for Player, liblcf and the Tools were completely rewritten to use modern CMake. These scripts support now compiling for all major platforms (Windows, Linux and macOS). We slowly plan to migrate most of our targets to CMake to reduce the maintenance burden. This includes deleting the Visual Studio project files and most of the platform dependent Makefiles (#1365). The SDL UI class was refactored and split into separate files for both legacy SDL and SDL2. This makes the SDL2 UI code much cleaner, because we have lots of workarounds in the legacy SDL code which were not needed anymore in the newer versions (#1327). Building against SDL2 mixer version 2.0.2 is supported (also recommended because of better mp3 support) now (#1297). Compiling on platforms that do not have a “d_type” field in the directory entry structure is supported now (#1334). Our App works now with “targetSdkversion=26” on Android. All apps updated after October 2018 must support this (#1323). Compiling on platforms where int32_t is not defined as int (but for example as long int) is supported now in both liblcf and Player (#1326). Our data access library (liblcf) can now better decide which fields and flags it needs to write for different database versions (#237, #240). The defaults for the terrain grid values were fixed, this should solve some overlapping battler issues which occured in RPG Maker 2003 games (#247). All enumerations provide now a string representation (#241). Another homebrew target, another port: This time for Nintendo Switch. The Switch is a very young platform for homebrew and we are happy to be one of the first available homebrews for it. As usual thanks to Rinnegatamante who also made the initial ports for 3DS and Vita. Compared to other homebrew platforms we support the Switch has a powerful CPU and playing RPG Maker games will be a very smooth experience on it. As usual for such ports you need a console with homebrew support to launch it. You can get the zip with all required files in the Download section (Continuous builds → Other). Extract the zip into switch folder on your SD card. Games are searched in the same folder as the nro. Which means for the default install this is /switch/easyrpg-player. Place the game (the folder with the RPG_RT.ldb) directly in the nro folder to launch the game standalone otherwise place the games in subdirectories to use the game browser. The RTP (RPG Maker 2000/2003 Runtime Package) should be placed in /switch/easyrpg-player/rtp/2000 and /switch/easyrpg-player/rtp/2003. Use the digital pad for walking. A touch ui is available in the corners for using the extra numpad buttons like 0-9 and Plus. These are used by some games (e.g. Yume Nikki). The touch works independend of the touch mode. When you are afraid of screen burn-in use mode 2 or 3. In some cases the audio playback will break. When this happens you have to restart the homebrew. We are one of the first homebrews that support audio and the API in libnx is not mature yet. This is a community provided port without official support. If you think you found a bug please verify first that it also occurs in the official versions (e.g. on Windows or Linux). If this is the case please report an issue. We also track switch-only bugs there but don’t expect them to be fixed soon because we have no Switch for hardware tests. You want to port to a platform that isn’t supported by Player yet? Contact us! While we develop our Player, we often need to run games in the original engine. Under Windows, this is usually no problem, but under other operating systems only wine or a virtual machine can be used. This seems to happen, because the font gets anti-aliased (a blurry outline is added) and then is rendered opaque. The solution is to not use wine’s font rendering. $ wine reg add "HKEY_CURRENT_USER\Software\Wine\AppDefaults\RPG_RT.exe\X11 Driver" /v "ClientSideWithRender" /t REG_SZ /d "N"
To make this easier I created a launcher script which does this automatically. You can find this script and the fontconfig configuration in this gist. In case of music problems, which happened for me with MP3, the native libraries (libmpg123 via gstreamer) can be disabled and the original Windows decoder can be used. $ wine reg add "HKEY_CURRENT_USER\Software\Wine\AppDefaults\RPG_RT.exe\DllOverrides" /v "winegstreamer" /t REG_SZ /d ""
This post is based on a blog post by our friend kakurasan. Thanks!